Bare-knuckle boxing has been banned for decades in America, but there is a growing belief (and some data) that says it's as safe as gloved boxing. There is some undeniable appeal in seeing two men (and now more increasingly women) fight one another in organized combat. A leading theory is that the outward display of violence satisfies a similar tendency brewing inside all of us, yet at the same time, few people ever want to see someone seriously hurt for the sake of diversion. This places the realm of fighting sports (and our acceptance of it) in a precarious position—one that walks a fine balance between violence and safety, entertainment and civility—and it is always seeking improvement on both fronts. Basically, how can we make combat sports more exciting for the public, but safer for its fighters? When put that way, bare-knuckle boxing appears to be the obvious solution. But let’s investigate that claim. The comprehensive standard of recorded boxing deaths is the Manuel Velazquez Collection, named after a meticulous anti-boxing activist from the 20th century, and is currently maintained by Joseph R. Svinth of the Journal of Combat Sports. The most recent edition tracked ring fatalities by time, location, and format of competition, all presented neatly in detailed bar graphs and pie charts. According to this report, there were 259 recorded ring deaths leading up to the decade when gloves became mandatory in competition, quickly disproving the notion of “not having a single ring fatality” during the bare-knuckle era. Looking at the data after that decade, however, does become interesting. The Marquess of Queensberry Rules that first mandated the use of gloves in pugilistic competition were first published in 1867 and fully adopted into the sport in 1882, though some bare-knuckle bouts took place for a few more years as the last recorded match took place with John L. Sullivan facing off against Jack Kilrain in 1889 (Hobbes’s claim of bare-knuckle prizefighting terminating in 1897 is also incorrect). Table 2 of the report outlines a side-by-side bar chart comparison of the number of boxing deaths by decade, and there is a noticeable spike from the end of 1880s to 1890s, going from 41 deaths to 134. The trend peaks and valleys in the following decades, but never dips near the numbers before the Queenberry Rules were instated. On the surface, this would suggest that the new rules (and quite possibly the use of gloves) played a major role on increasing the rate of fatalities in boxing, but as the first rule of statistics goes: Correlation does not imply causation. A number of factors that could have affected those spikes. First, instating the Queensberry Rules legitimized boxing in the public eye, and because of this, far more bouts and their related statistics were being organized, sanctioned, and documented on public record. Because of the longtime legal ambiguity in bare-knuckle boxing, there could have been a number of deaths that were simply never recorded. Along those same lines, data collection methods and technology have improved over time, as did general upkeep of historical records, so it may not be that more deaths are occurring in boxing, just that we’re getting better at keeping track of them. Another reason could be that there were simply more fighters participating in the sport. Once boxing became more socially accepted, top fighters began filling movie screens, newspaper headlines, and earned substantial sums for championship bouts, thus influencing generations of young men to willingly take part in the fistic trade. This growing interest led to the further development of boxing’s amateur program (which also saw a growing number of deaths as time progressed) as well as an emigration of the sport to other countries. Therefore, the upswing of deaths in the ring could simply be due to the fact that there were more fights taking place. Whatever the cause, it is difficult to use findings of the past to determine the safety of the sport today. So much constantly changes within the sport of boxing that trying to compare between eras is essentially like trying to compare completely different sports. Perhaps then a better approach is not to look at the sport’s past, and instead on its present and foreseeable future. Probably the best contemporary example of bare-knuckle boxing is the BYB Extreme Fighting Series, the most recent organized attempt at reviving bare-knuckle fighting to become a sanctioned sport. Followers of the subject may recognize the league as the evolution of the principle subject matter in Billy Cohan’s documentary “Dawg Fights”, a film following the lives of fighters and promoters of an underground bare-knuckle boxing league in West Perrine, Fla. Most recently, the league had its first pay-per-view event called Battleship 1, where competition rules included no holds, no breaks, and of course, no gloves. 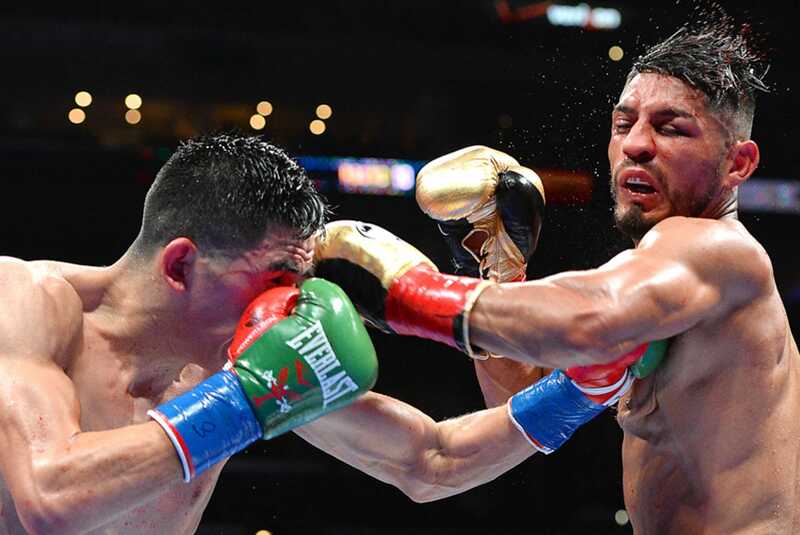 “We believe the gloves cause more long term damage over a bare-knuckle punch, which causes superficial injury, and all the fighters that we&apos;ve talked to, they all say that they&apos;d much rather fight without the gloves,” says Mike Vazquez, president of BYB. Vazquez further advocates for the league’s safety by pointing out that less punches to the head are thrown in bare-knuckle fights due to fear of breaking one’s hand on an opponent’s skull. The first notion of the gloves being introduced into the sport to protect the fighter’s hand and not their opponent’s head has some truth to it, at least if one reaches back far enough in history. Strips of leather binding the hands of Ancient Greek fighters constituted the world’s first recorded boxing glove, and was introduced to make punching safer for the attacker. The second notion of gloves creating more exciting matches for the audience has some truth as well. Back when pugilism first entered the Roman Empire, the notorious “caestus”—a glove made of leather strips and at times filled with iron plates, blade and/or spikes—was used to intentionally make contests between combatants more bloody and violent for spectators. But boxing gloves today are hardly made with such material, and instead commonly filled with a composite of foam and animal hair. Their primary use may still be to protect a fighter’s hands, but there are no longer the lethal additions to further the injury of an opponent. It is also important to consider what other purposes the hands serve in a boxing match aside from being a method of attack. Utilizing blocks, parries and other mechanisms of defense greatly determine a fighter’s safety, and the presence of gloves increases those defenses substantially. Plus, arguing that a hand will break before the head isn’t exactly the most appealing approach to advocate for a safer sport. That is, at least, the view of Dr. Larry Lovelace, president of the Association of Ringside Physicians, one of the leading international organizations that sanction ringside physicians in combat sports. Lovelace has been president of the association for a year, and a ringside physician for more than thirty. But it is also undeniable that fewer punches are thrown and landed in a bare-knuckled match than a gloved one. A large part of that is because the added protection allows the hands to withstand the damage of high-volume punching, and a fighter can throw with more conviction operating under that belief. In order to deem that socially acceptable, it would need to be true that a bare knuckle shot objectively inflicts more damage than one with a glove. Proponents of this view will often cite the example when Luis Resto illegally used unpadded gloves to give Billy Collins a hellacious 10-round beating that post-fight sent Collins into a debilitating depression, and eventually resulted in his suicide. What observers tend to forget is that not only were Resto’s hands tightly wrapped with tape and gauze, but a highly illegal and dangerous plaster-like substance was also later revealed to be found in the wraps, making his hands much more lethal than a bare-fist. Speculating the force between the two punching conditions is a valid one however, and probably the next best place to look. This clip, from National Geographic’s “Fight Science”, features mixed-martial-artist Bas Rutten striking a monitored punching bag using boxing gloves, MMA gloves, and a bare fist. The results showed the bare fist delivering the highest output at 771 pounds of force compared to the MMA and boxing gloves of 651 pounds and 641 pounds, respectively. This would suggest that gloving the fist reduces a punch’s impact, thus making gloved competition less harmful. But one of the biggest criticisms of the show has always been their questionable methodology. In this particular experiment, details of the force measuring mechanism are never explained, and it would be unlikely that all three punches were thrown in the exact same manner. A far better measure would be to have an average taken over a number of punches using the different gloved and ungloved conditions. This would at least produce something closer to the more statistically significant findings found in academic and medical studies. One such study from Washington State University measured the differences between a boxing glove, a thinly padded karate glove, and the bare fist amongst 15 karate practitioners of different rankings. By averaging a number of punches amongst the number of practitioners, the study found that the highest generated level of bag momentum was found in the boxing glove, and a virtual indifference between the bare fist and karate glove, pretty much the exact opposite of what was found by “Fight Science.” The downside here is that the study was conducted in 1986, so perhaps its datedness cancels out the lack of sample size from Nat Geo. But even in using elementary physics, there is no clear answer. We know that force equals mass multiplied by acceleration, so the weight of the boxing glove would increase the mass, but the padding would also disperse the force upon impact, and presumably slow the punch down. The trade-offs are everywhere. “I’ve seen people that have had liver lacerations and splenic ruptures from body blows. It's just—which organ do you wanna damage?" That is ultimately the conclusion as to whether bare-knuckle boxing is safer than gloved boxing. There are so many variables in determining the devastation of a landed punch—from technique to timing, to whether or not the receiver saw the punch coming—that it would be virtually impossible to determine in a live match which variable caused the most damage. And if in fact a bare-knuckled punch is more harmful, that would also mean a punch that would knock someone out in a bare-knuckle bout might not do so in a gloved bout, which would presumably expose both fighters to prolonged head trauma. So then which is safer? A quick KO or taking a greater number of lesser punches over more rounds? Pick your poison, I suppose. Furthermore, there are a number of other elements that determine ring safety—the number of rounds, the presence of medical staff, and the pre-fight check-ups are a few examples. According to Vazquez, BYB Extreme follows the same medical protocols as licensed boxing, and their fights go on for an uninterrupted 10 minutes whereas traditional boxing can go anywhere from 12 to 36 minutes. So then the same question arises. What is more harmful? Thirty-six minutes of gloved boxing, or ten minutes of bare-knuckle? Again, it’s hard to say. One can never truly make the claim that bare-knuckle boxing is safer than gloved boxing, or vice versa. I will admit that in doing the research, bare-knuckle boxing does appear safer than I first thought it to be, and at least in theory, some of the arguments advocating for the sport make sense. But until bare-knuckle boxing can become a sanctioned sport and provides a large enough sample size to research, the statistics on its safety simply aren’t there. Until then, it is a debate that will remain unsettled. Nick Wong is a traveler, writer, and photographer that has spent the last decade exploring the world through the culture of prizefighting. He can be reached at this email address and his work can be seen here.